Music at King Charles is delighted to recommend a lovely concert at St Luke's church in Tunbridge Wells on Saturday 12 December, at 7pm. The wonderful harpist and soprano Ellen Smith, who is a regular performer at King Charles, is joining saxophonist Michael Grant to play Christmas favourites, folksongs and other classics. Definitely a great evening's entertainment! St Luke's church is on St Luke's Road, TN4 9JH. 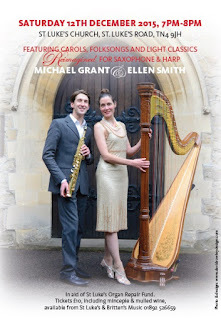 Tickets are just £10 including refreshments and are available from the church or from Britten's Music, or on the door. Meanwhile, details of concerts in early 2016 at King Charles will be released very soon.